Two sommeliers, one of them a star of the new documentary Somm, teach the basics of Santa Barbara's wine by focusing on three components: grape variety, alcohol level and age. The Master Sommelier test is like the bar exam for wine experts—if the bar involved eating the paper your test was printed on and pinpointing exactly where and when the trees were grown that were pulped to create the pages. As I learned from watching the new documentary Somm, the test is amusingly hard (unless you’re taking it, and then it’s just hard hard). Less than 200 people in the world have passed the test to earn the Master Sommelier distinction, and of the 32 people who attempt it in the movie, only six succeed. One of the aspiring somms is Brian McClintic. Recently I traveled to Santa Barbara, California, to meet him and fellow sommelier Eric Railsback. I sought their help. Like many people who enjoy wine, I thought I knew a bit about it; I can amble my way through a list. Then I watched McClintic prepare for the big test, using something sommeliers call the “tasting grid” to masterfully assess wine after wine: sugar, acid, tannin, density, alcohol, body, fruit, wood, earth, complexity, balance, finish. I felt like an amateur blackjack player watching a professional card counter. I wanted to learn to comprehend wine with the same amount of skill. Of course, part of me wondered if that was even possible, or if some people are born with superhuman palates. McClintic assures me that’s not the case. “For years, I had a problem recognizing American oak,” he says. “People were like, ‘Can’t you smell the coconut?’ Nope. ‘What about the sawdust?’ Nope. Then someone said ‘sweet and sour,’ and suddenly, I could smell it.” In other words, taste can be taught, and I was eager to use Santa Barbara’s reinvigorated wine scene as my classroom. It’s a scene Railsback and McClintic know well. The pair recently partnered to open Les Marchands Wine Bar & Merchant, an ambitious new wine bar in the town of Santa Barbara—a place they arrived at via very different paths. Railsback, 28, ran the highly regarded beverage program at Michael Mina’s RN74 in San Francisco. McClintic, 37, only came to wine after trying his hand at screenwriting and professional poker. The plan is to complete our lesson at their wine bar, but first, the somms have suggested a field trip to visit some local winemakers. We also set some parameters. I know there’s no way I’ll be able to tackle the whole tasting grid in a day, so we limit our lessons to three key components of wine you can glean by looking at any label: grape variety, alcohol level and age. We meet at the Wine Ghetto, a cluster of old agricultural warehouses in the small farming town of Lompoc that’s now home to nearly 20 small wine producers. Santa Barbara County is considered a cool-climate wine region, yet on the 50-minute drive here from downtown Santa Barbara, we go through coastal hills protecting steep valleys, each with its own micro-climate and varying terrain. It’s sunny and warm on one hilltop, then misty and cool around the next bend, providing growing conditions that are suitable for many different grapes. This diversity has attracted grape growers since the 1970s. For this reason, Santa Barbara has proved irresistible to a new class of young, super-focused winemakers like Justin Willett, 32, the owner of Tyler Winery. Willett uses Burgundian grape varieties (Pinot Noir and Chardonnay) for his own label; Loire varieties (such as Chenin Blanc and Cabernet Franc) for a label called Lieu Dit in partnership with Railsback; and Rhône varieties (like Syrah) for a project called Vallin, a collaboration with Railsback, McClintic and Dustin Wilson, wine director of New York City’s Eleven Madison Park. What unites these guys—as well as a small but like-minded group of other producers in the area—is a commitment to making balanced, lower-alcohol wines, no matter what the grape. I taste his wines, starting with the Pinot. As promised, the Tyler Pinot is light and energetic. The somms explain that the best new local Pinots, like this one, are not as overtly fruity as versions that have been coming out of the area for the last decade. Personally, I still get some nice fruit flavor in the Tyler wine, but rather than sweet purple fruit, like a plum, it’s fresh and crunchy, like a raspberry. Then we try the Syrah, which McClintic says is one of the most under-appreciated local grapes. It’s food-friendly, but delicious on its own. Plus it has good acidity combined with a meatiness and pepperiness that reminds him of charcuterie—and who doesn’t like some charcuterie with their wine? “A lot of Syrah is really deep and heavy,” says Railsback, but the Vallin doesn’t feel weighed down. Finally, we move onto the Cabernet Franc. “Typically, in America, when people think of Cab Franc, they think very dark, rich fruit,” says Railsback. But the Lieu Dit is almost the opposite of that, deliberately bright and floral, like a Cabernet Franc from France’s Loire Valley. Santa Barbara’s incredibly diverse soil types and micro-climates make it possible to grow a range of grape varieties. By harvesting early, Santa Barbara producers can create Pinot Noirs that are light and elegant, and not so ripe and fruity. Syrah from Santa Barbara can be sadly under- appreciated. It is peppery, bright and delicious. 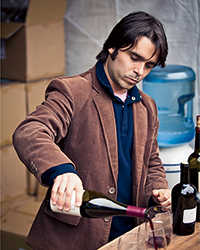 Joining us around the tasting table is another local winemaker, Gavin Chanin, who even at the unripe age of 27 is getting a lot of attention for his low-alcohol Pinots. 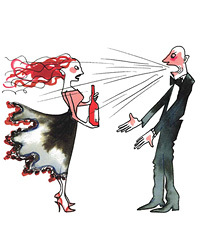 “I don’t like to say ‘low-alcohol,’” he corrects me, “because I think it’s the right amount of alcohol.” Most of us don’t think too much about the amount of alcohol in wine, until maybe the morning after, but it has become a hot-button topic among wine geeks because it’s so linked to flavor and balance. Chanin explains why: The alcohol in wine comes from fermented sugar. Grapes develop more sugar as they ripen, so the less ripe the grapes are when they are picked, the lower the alcohol level of the wine. Santa Barbara’s winters are relatively warm, so the vines start flowering earlier; but the summers are temperate, so fruit can stay on the vine longer and ripen more gradually. This means producers are able to pick less-ripe fruit without sacrificing the desired flavors and colors. Everyone around the table agrees that there is no single “correct” level of alcohol, and that different grapes naturally achieve balance at different percentages (which is really the goal). Even within Santa Barbara County, you’ll find top Pinots ranging from 13 percent up to 14.5 percent, depending on the style of the winemaker. To taste the difference, we uncork one of Chanin’s Pinots, with an alcohol level of 13.15 percent, and a bottle of 14 percent Pinot from Brewer-Clifton, an excellent producer that’s been making wine in Santa Barbara since 1996. The difference of less than a percentage point may not sound like a lot, but the more you pay attention, McClintic assures me, the more you realize its significance. In fact, you can see it. As I swirl the wines in glasses, the Brewer-Clifton is darker and more viscous (alcohol produces glycerin). I take a sniff. It’s not as if the Brewer-Clifton comes close to searing my nose hairs, like grappa, but the lower-alcohol wine definitely smells more of bright red fruit, while the Brewer-Clifton has a deeper, black-fruit aroma. “You don’t so much taste the alcohol as feel it,” says McClintic: “Take a sip and exhale; you’ll feel it in your chest and esophagus.” Swishing the Pinots in my mouth, I’d say the higher-alcohol wine feels rounder and less springy. Both styles are, to me, certainly delicious. The amazing thing is that they both come from the same variety, just a few vineyards over, picked a few weeks apart. Of course, if you’re really thinking like a somm, you’re always considering how a wine will pair with food. A low-alcohol Pinot will pair with a more elegant dish, whereas a bigger, higher-alcohol Pinot can handle bigger flavors, like barbecue or steak, says Railsback. The moderate climate in Santa Barbara allows winemakers to harvest grapes that are flavorful without being high in sugar. This translates into wines with lower alcohol levels. Every wine has a different ideal alcohol level. Some can be balanced even at 15 percent. 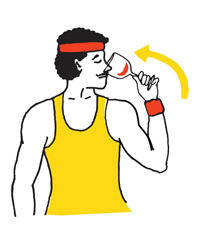 Lower-alcohol wines go best with lighter foods; higher-alcohol ones with hearty dishes. Santa Barbara is considered a young wine region, and compared to many places in Europe or even Napa, it is a baby. Still, producers like Sanford and Qupé have been making ambitious wines here for decades. When McClintic and Railsback look for prototypes for the kind of balanced, low-alcohol wines they hope Santa Barbara will soon be famous for, they skip over the past decade and instead look back 15 to 25 years. To taste a few of their favorite old bottles, the two sommeliers and I head to their soon-to-open wine bar, Les Marchands, in Santa Barbara’s Funk Zone—an awfully named but super-hip neighborhood with 23 tasting rooms in old industrial spaces. Les Marchands is in a new, 16,000-square-foot space that will also house a brewery, a distillery and a 150-seat restaurant called Lark, whose beverage program the two will oversee. Les Marchands, which feels like a giant cellar, will serve snacks and a handful of locally driven dishes, but the focus is on European bottlings, as well as wines from Santa Barbara’s present and past—like the three we’ll try today: a 1991 Qupé Syrah, a 1994 Au Bon Climat Pinot Noir and an Ojai Vineyard Pinot Noir from 1997. “Certain things stick out when a wine is young, like fruit, oak and acid,” says McClintic. “As wine ages, all that stuff starts to integrate, and you start to taste secondary flavors, like herbs, mushrooms, soil.” Tasting like dirt may not be the greatest sales pitch, I think, as McClintic opens the three bottles. As he pours, Railsback also explains that while a really aggressive young wine may need to be decanted for hours, older wines tend to be accessible more quickly. It’s true: Within two minutes, they’ve opened up and I can smell a little fruit and a lot of minerality. Next we try the aged Qupé Syrah, and for me, it is a revelation. Maybe it’s because the Syrah grape is naturally more full-bodied, but this retains all the oomph I loved in the Vallin Syrah. There’s still some cherry fruit, but it fades over the course of the sip, yielding to intense spice and a lovely, dry, herbal finish. Overall, it’s meaty, tannic and awesome, and it may be my favorite of all the wines we’ve tried today. In this 22-year-old Syrah, I see a bright future for Chanin and Willett and other members of Santa Barbara’s up-and-coming class of winemakers. In 15 or 20 years, their wines may be even better than they are today, and they’re pretty fantastic right now. Santa Barbara has been making wine since the 1970s, and today’s progressive winemakers look to that style of balanced, lower-alcohol wines. 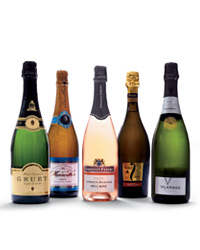 Young wines tend to offer fresh aromas of fruit and oak, while older wines reveal more earthy, developed notes. Decanting young wines can help them open up sooner. Old wines can unfold in the glass. David Katz is a magazine and television writer living in Los Angeles.